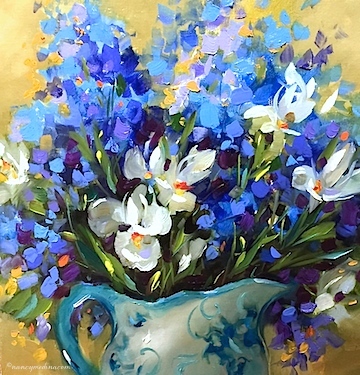 Garden Party Iris is the newest daily painting in Flower Mound Studio. One of my friends asked me if I paint every day. 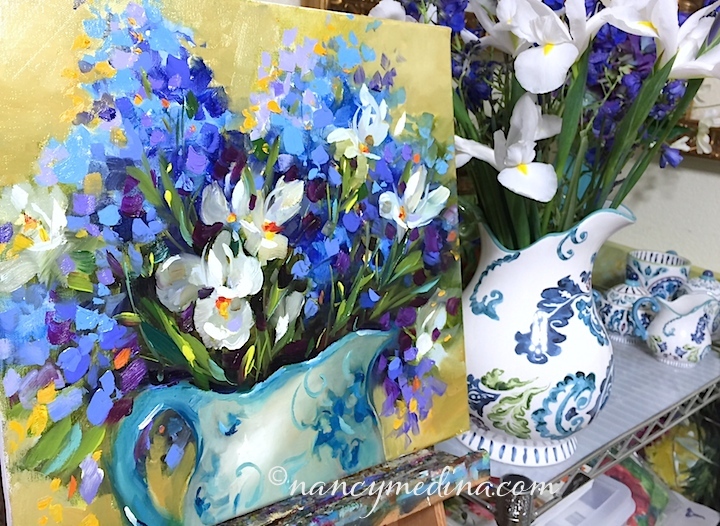 The answer is yes, unless I'm on an airplane on my way to teach a workshop, I paint every day. I've been painting every day for about 7 years now. I have a condition called the Daily Painters Compulsion. I'm pretty sure I should be on some sort of strong medication for it. Today I went to the store for lemons and found yet another new vase. Then I saw these iris, and then the delphiniums, and then bunches and bunches of fresh peonies. Then I saw a really cute green roller bag I could use on the plane to stuff my treasures in for my trips to and from workshops. I won't tell you what my grocery bill ended up being, for that bag of lemons, but let's just say this is how things rapidly spiral out of control, when I'm allowed to go shopping with no adult supervision whatsoever. The new sparkly wonderful vase makes its debut!